We have driven some 3000 miles from the Great Wall at Beijing to Shigatse, the second capital of Tibet. Our drive has taken us on good road and 4x4 tracks. We have visited Buddhist shrines, Quin tombs, driven through steep and spectacular gorges and most notably visited the Terra Cotta warriors at Xian, lost for 1000 years until rediscovered in 1974. On roads we are accompanied by a plethora of Chinese on bikes, trikes, carts, tractors, trucks and on foot. They use both sides of the road, in either direction. Inside overtaking is routine. Roundabout and traffic lights are ignored, and pedestrians may be seen stopping for a mid-highway chat with trucks rushing past them on either side. 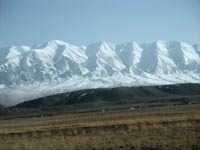 We left the bustle of central China as we drove west into the central Asian steppes. The land became barren, desolate and beautiful. We reached Lake Quinghai, the biggest salt lake in the world and at 10,500 feet China's highest. It was very cold. Next day we passed mounted shepherds in local costume herding sheep and yak. Up a steep pass we came to the Tsaidam desert where we saw wild camels, wild horses and shy little desert voles. Nick and I pulled off into the desert and lunched in the company of two nesting falcons. They tolerated our presence with cautious curiosity. For lunch we raid the hotel breakfast table and pilfer boiled eggs, bread, fruit and tsampa, a hot guey Tibetan porridge which keeps you warm throughout the day. 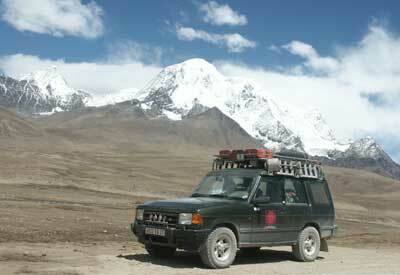 We left the desert and entered the foothills of the Tibetan plateau. The scenery changed quickly from hills and valleys to mountain. One valley was 100 miles long and by the time we had reached the end, rising all the time, the adjoining mountains were snow-capped. We had a 13 hour drive next day from Golmud, up the spectacular pass into Tibet, all at over 13,000 ft. By now several of our group were afflicted with altitude sickness. We left the truck route and turned up a gravel piste, corrugated and potholed. Most bridges are unusable and we forded the rivers we encountered. We were climbing all the way in progressively more spectacular scenery. Snow-covered crags glistened in the bright light and the peaks soared above us. We hit 16,000 ft, the GPS giving altitude fixes as we went. The oxygen starved Land Rover emitted black smoke but thundered on valiantly. 17,000 ft and the air was rarefied and cold and we were already higher that some of the snow covered peaks. At a dizzy 17,800 ft we reached the top of the pass, one of the highest roads in the world. We gasped at the beauty and we gasped in the low oxygen. Every step made heavy demands on the lungs. We continued on to our Battery Operated hotel, where all power comes from solar panel and lights fade around 9.00pm! The journey was horrendous as the road was closed, and we had to drive down the river bed, cross several fords and mount a few undriveable slopes. Everest - We left at 5am, in the dark, and drove up a steep mountain pass to 17,300ft, and arrived at dawn to see the first light of a new day striking Mt Everest. Our planet's biggest mountain emerged out of the grey morning mist, the sky cleared and there she stood in all her wonder.... this was a truly awesome experience... We stood in silence and venerated this majestic scene, one of the wonders of the world. As the sun rose, this mighty mountain became sharply outlined with it customary plume of cloud. The red light of day picked out the renowned profile while on either side stood attendant mountains of immense height and the whole vista was one of the most memorable of this trip. We drove another 5 hours to Everest base camp and trod the ground of history, witness to so many attempts and so many failures. Mountains are a tough environment. The whole of the Everest experience was amazing, and we were blessed, unusually, with crystal clear weather. Now we are back on the road south through Tibet where the people are friendly, shy and courteous. We always get a wave and a smile as we drive though upland valleys. Tiny pockets of arable land are ploughed by Yak, tended by colourful girls and young children. 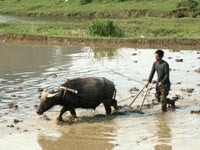 The men harness the yak and the girls sow the seed crop. Lhasa - We arrived at Lhasa and visited the Potala Palace, the Dalai Llama's disinherited ancestral home. The walk up the hill is demanding at the 14,500 ft altitude. The 1000 rooms are being restored and this great old building is in good order. 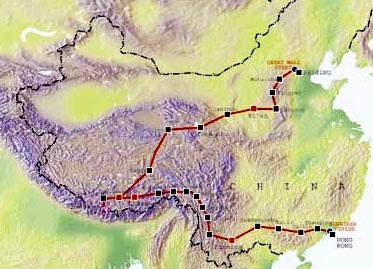 We have some tremendous travelling to do to cross the impenetrable ground between the high Tibetan plateau and the lower slopes of Yunnan - we are now adjacent to North Burma, and have crossed and recrossed the Yellow River several times. We left Lhasa before dawn to beat the scheduled 7 am road closure, and drove up to 12,000 ft. in cloud to the peak of the surrounding mountains. By first light the clouds were below us and the land unfolded into a rare verdance unseen for weeks. Long lichens hung off spring leaves, the temperature rose and we entered a wonderland of greenery. Early rhododendrons flowered in the morning sun, primulas decked the ground and the forested slopes thickened into a densely clad landscape - retreating behind a densely wooded curtain of greenery. We reached Bomi and caused much amusement on the one high street where we invaded bars, moved all the chairs outside and drank gassy Chinese beer in the afternoon sun. Another early start and a horrendous gorge with a rough, unmade road. We bounced rattled and shook over fords, bumps, pot-holes, washboard ripples, and big loose rocks. The road clung to the side of the fast flowing river Mekong, and in some places had slipped away entirely. After I hour, we had covered 8 kms. After 5 hours of difficult driving we reached the top of the pass at 12,500 ft and drove off the verge to a wonderful lakeside lunch site. Bernard followed in that amazing Hummer and then Ian and Audrey in their Mercedes and Paul in the Toyota. We had a memorable picnic together and shared our beer, wine and food. By contrast, the next section was a new military road and we made good progress. We passed the snowline at 15,500 ft and drove through recently cleared snowfalls. Someone built a snowman. Down the hill to Bayi the weather turned tropical and we were in shirt-sleeves until evening. Bayi was memorable for its unfinished hotels and despite the endeavours of numerous builders, provided no water and no electricity. We had dinner and then danced in the forecourt and played football with the locals - they were amazed, few had ever seen a Westerner before in this remote place. After dark we groped our way into the reception area to find a blaze of candles romantically arranged up the banister. We took one each into our room and slept the uncomplaining sleep of exhaustion. Early start again, up to the now-melting snowline where we encountered ice, slush, rain and mud. All cars were unrecognisable in their muddy cloaks. We crossed lots of high passes over 15,000 ft then several long deep gorges, dodging rock falls, ruts and rocky obstructions. We shared Chinese noodles and beer at our picnic site and arrived in the evening at Denquing. This was a hillside town full of bustle and colour. We bought two trud baskets and some flavoured chips. We found a nice hotel and took the first bath for 3 days. Left Tibet at Dequen and reached the fine old ethnic town of Lijiang. We are still descending through gorges draining the Tibetan plateau. We are following the Mekong river but cross and re-cross the Yellow River too. We are now in Yunnan Province and see many tribal costumes in this multi-ethnic district. Most noticeable are the Naxi women in their distinctive square hats. Lijiang is a beautifully preserved historic town and we spent the morning strolling the old streets, admiring the traditional architecture and buying small items of jewellery clothing and bargaining for antiques. In the afternoon we left for the short drive to Dali where we saw the two famous pagodas and stayed in a hotel with views of the lake. We are still over 6,000 ft, even this far south. Kunming was a big industrial town, reached after a long and difficult road. Motorway at first, it degenerated into an exceedingly rough and uncomfortable track packed with heavy lorries and laden with thick yellow dust. We left Kunming for the long drive to Huangguoshu Falls stopping briefly at the picturesque "Stone Forest" area where we took photographs. In the afternoon, we had a major holdup when a lorry-load of pigs over-turned on a one-way road-works diversion. We were delayed 4 hours, and finished our journey 12 hours after setting out. We arrived after dark and checked into the splendid Waterfall Hotel which was set in a verdant garden humming with moths and insects. Next morning we walked down the spectacular Huangguoshu falls, a sheer curtain of water spilling over a 274 ft cliff. We walked up to it and then through a great cleft behind the water and emerged wet and visually enriched. We returned to the car and drove an easy road to Guillin where we spent the night. We have journeyed through the sparse wastes of the Tibetan plateau in the North, to the rugged ravines of Yunnan province in the West, we have come at last to the verdant tropical South where climate and fertility nestle together, and the Chinese peasants live a simple and rewarding agricultural life. We left early as usual and passed many Chinese children trekking their way to school. Some of them have to walk a long way to the next village. Little pig-tailed girls lead their short cropped brothers, a sense of concern showing on their young faces. The older children laugh and play on the way and all smile as we pass. Some call out hi-lo and we call back hallo. On the road we encounter piles of carefully saved compost, dumped at random, ready for spreading on the fields. Everywhere in this area is peppered with small rice paddy fields, all glistening in the morning sun. Some fields are only 15 metres long and all are irregular in shape, giving the countryside a colourful patchwork face. Great grey water-buffalo raise their shaggy heads and toil slowly up and down through the mud. They love water and wear a benign and peaceful expression, carrying their head back and chin up as if savouring the last of the air before they sink into the water. They pick their legs high, with surprising elegance, as they draw the plough or harrow, and at the end of each short run they turn, without waiting for an order, and slowly toil their way back again. The plough usually has only one share and the work doesnt appear to be too arduous. The ploughman wears plastic sandals, his trousers rolled up to the knees, and speaks encouraging words to his beast. The soft dialogue can be heard wafting across the silent rice pools. The only other sound is the rhythmic splish-splosh of the buffalos huge hoofs as he treads carefully through the mud. Chinas trademark bamboo pole is used by everyone, shouldered as it is across the back, and they carry everything from baskets of stones for road building to pans of seed plants, newly harvested vegetables, sweet corn, melons and great bunches of green leaves. The women may also be carrying a toddler on their back as well, and a pair of tiny feet would be seen hanging loose and content as the baby nods off to sleep. We were driving down a steepening gorge where the slow-flowing river was bordered by an unbroken mantle of greenery. The impenetrable verbiage reached from the waters edge up to the peaks 500 feet above us. Every subtle shade of green spoke of a fertility beyond compare, while the sheer valley walls barred any form of agriculture. We left the main road and ascended into the steep hills bordering the river valley. Soon the river disappeared from view and only the tumbling tributaries remained. Great blue butterflies, the size of starlings, flopped lazily across the fields while darting dragon flies zoomed purposefully about their business. Broad-leafed banana plants waved faintly in the still air and soft willows rustled as we cruised by. Soon we passed small hillside villages full of country activities. A flock of duck marched boldly down a main street, with bikes, trikes and carts weaving skilfully around them. Ducks have the right-of-way in China. The houses were prettily built but unadorned, with hand-made brick or stone to window level, then timber cladding to the roof line. As we went higher up into the forested hills the houses were all timber-built, and whole trunks were used to stand the houses level on the unforgivingly steep ground. Street vendors sold a multitude of tools, materials, agricultural tack and food, and none had ever seen a Westerner before. We wandered self-consciously in the market place while the Chinese stared in friendly curiosity and unashamed wonder. I bought a Coolies straw hat at one store, and a lukewarm drink at another. Then I invested in a pretty reed-woven tool basket. The basket is shaped like a curved Saracens scabbard with an elegantly turned end; the rice planters in the paddy fields all have one strung over their back. We are still climbing and the temperature reaches 97 F, and the movement of air through the open windows of the Land Rover is welcome. Every inch of available space is terraced into paddy fields. These small irregular shapes follow the contour lines in a variety of shallow crescents. At one high crest we saw the whole valley below us had been terraced, a terrific investment of time and labour long ago. Hundreds of pools glinted in the morning sun and decorated the valley like petals strewn from a spring bloom. It is too steep here for the water buffalo, the heavy beasts would never make it up the slopes. Girl-power is the key to agricultural success, and I saw several smiling girls harnessed to simple wooden ploughs which the men would guide from behind. What a grand statement of village unity! The sight and sound of the workers in these watery fields has probably changed little in the last 1,000 years and here we felt transported in time to a prehistoric era. Reality returned when we descended the hillsides again and drove the riverside trail. The road builders hew out swathes of broken hillside and cut a rough road which clings precariously to the valley wall, 20m to 30m above the river bed. There are no embankments here and no safety rails, and cars and trucks regularly slip down the escarpment and into the river. In most cases the wreck is beyond economic recovery and the vehicle will be stripped bare and carted away in pieces. Winter rains carve big ruts across the track and we weave an ever changing route between loose shale, rock falls, mud-filled ruts and deep potholes. Every half mile there is another hairpin bend, the corner pounded into thick dry dust by repetitive use. The corner and the dust may conceal anything from an impassable landfall to a wrecked, overturned truck. The dust hangs in the still air and invades every part of the car and its occupants, filling our lungs and coating our sunglasses. Broken roads may be repaired with sharp, undressed granite rocks the size of footballs, and we drive across the punitive surface wincing for our poor tyres. We completed the journey to Shenzen where we had a great welcome from the Chinese for our memorable journey. We drove our cars down the the Customs house for shipping back home, and took a coach the short way into Hong Kong.